The Harder the Job, the More You Sing! Today there are two men singing under my house. 🙂 I could never have anticipated such a delightful surprise. There are some real advantages to being financially challenged. Not poor, mind you! Though some folks have referred to me that way, I will never be poor. Being financially challenged is what has brought the singing men, men who are, as I write, “rolling plastic” under the house as part of a major project to completely weatherize my home. For 27 years I have happily resided in a hundred year-old Mill Village cottage that has no insulation. The last of the property’s old outhouses (and only one of two in the village still remaining) is standing in my back yard. It was actually considered a “contributing structure” [meaning, of significance] by the National Park Service when they approved the village’s placement on the National Register of Historic Places. Though there are now several N.R.H.P. districts in town, our village has the distinction of being the first. storm (thank goodness for insurance). 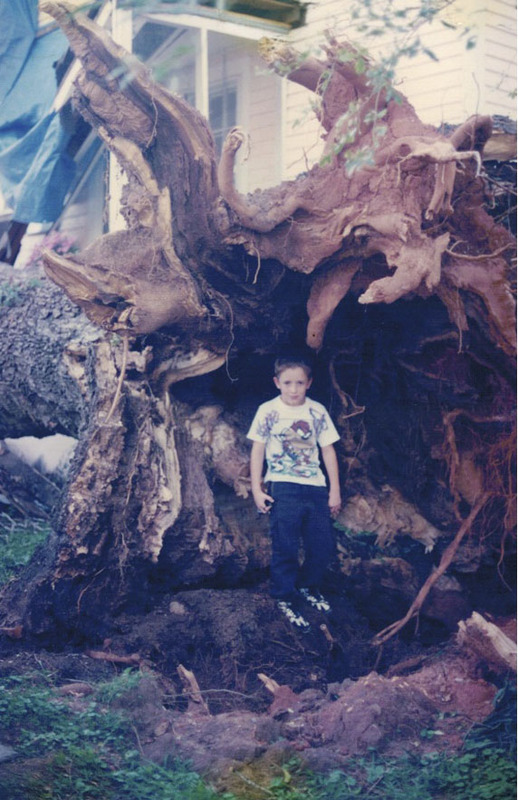 This was a storm that managed to hurt neither my mother nor I. Mama stayed here the night it hit and was in the bedroom that my Wake County-designated “Capital Tree” hit when it fell. It was to be measured that week for statewide status as a Champion. As she fell, she sheared off most of the front porch and punched a hole in the bedroom above my mother’s head. My old and beautiful friend – an Ailanthus, or “Tree of Heaven” in common parlance – lived up to her name, falling in the only way it could to not crush my mother’s car in front of the hedges, or her dear self as she lay in her own mother’s Jenny Lind bed. You can’t imagine my relief when, having heard the loud storm get even louder (which is what sent the tree crashing down) I heard Mama call out, “Amy Lou, something’s hit the house.” I’d known that in those few eternal seconds of course, and in so knowing also knew it hadn’t hit the side where I was abed and wide awake. This house and home have not only given shelter and beauty as early childhood pain and dysfunctional behavior was transformed, it has also given me countless opportunities to learn to feel and express compassion for others, specifically my neighbors, many of whom I once viewed in ways I’d be ashamed to admit. I’ve learned well the teaching that everyone is my brother or sister; everyone is another “me.” As I’ve come to love myself I now can love my neighbors, both here and around the globe. It is here in what will very soon be a snug as a bug in a rug house that I expect to remain the rest of my life. I can think of no good reason to be anywhere else (though I still miss the beach and the marshes where I grew up). Here, though, ashes scattered in the back flower garden and a grave underneath the birch tree at the corner of the front porch hold the memory of Niagara (my black cat, a.k.a. “the yellow-eyed midnight sneak”) and the bones of Sophie (the buff-colored one, a.k.a. “a beautiful golden ball of light”). This was her description of herself, with which I totally concur. Would that we all remembered this about ourselves as easily as she was able to do! Having spent a number of years in the financially challenged category, and finding that I am not too vain to receive certain kinds of necessary aid, I am now a grateful participant of the county’s weatherization program (implemented by Resources for Seniors). There have been many preliminary steps already taken at the house in preparation for today’s start of the Really Big Deal: INSULATION! I’m sure looking forward to finding out what it will be like to have a truly warm – and cool – house! Oh, Amy! How absolutely wonderful! May I come in during the winter to feel how an insulated home feels like? I too live without insulation! Yet, I stay as well…until led somewhere else…and only when led. I finally put on my AC today. The humidity had begun to feel like I was wearing heavy towels around my person. I so appreciated these photos. 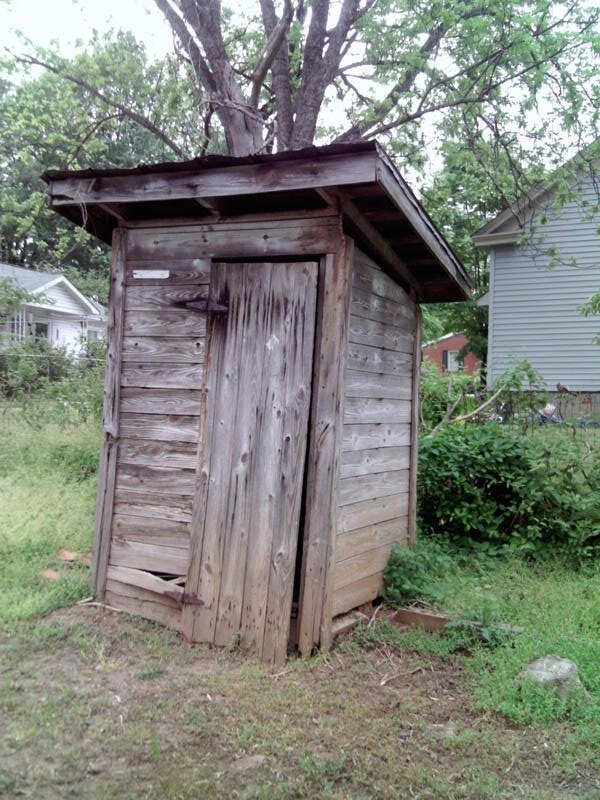 Is there still a hole where the poo and pee can go in the outhouse? Blessings to your men…always and forever! I gave chocolates and cookies to Alfredo and Antonio who helped this old place a week or more ago…something with long pieces of lumber! Much light and love to you, beautiful neighbor!